Note: This is NOT a recent trip! Another trip to Chitradurga hung over my head. My previous travel there was very tiresome. Chitradurga is only around 4 hours by road from Bangalore - a shade over 200kms. But this make it a cumbersome experience if you are looking to reach there early in the morning. The last time, I had to leave at a very unearthly hour to make it there on time. 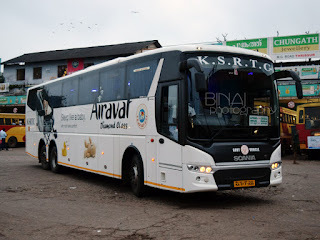 This time, though, I had to be there only by around 11am - and as if it was godsend, there existed a KSRTC Airavat bus scheduled perfectly at that time. Without a second thought, I booked tickets for myself, and two of my colleagues, who were also headed to Chitradurga. Like every time, I found it really difficult to get off the bed, and ended up being slightly late. And, the app cab I had booked did not turn up on time, delaying me further. It was past 0625hrs by the time the cab wheeled out of my neighborhood. 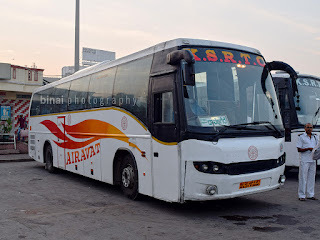 Soon after the car got moving, I got the SMS from KSRTC with the bus and crew details as well! I had reserved for a bus that departs from Bangalore at 0655hrs. I asked the driver to hurry a bit, but the traffic (at that hour, surprisingly or shockingly!) did not let him do that. However, he managed to cover the 15.02kms distance in a shade over 23 minutes, and I go to Kempegowda Bus Station aka Majestic by 0650hrs. By now, the conductor of my bus called up to enquire about my whereabouts - I told him I was walking towards the bus, and he, certainly, was near the bus looking out for me. A run down Volvo B7R of Davanagere depot, KA-01-F-9090, was doing the honours. I got into the bus exactly a 0655hrs - and met a lot of familar faces inside (all of them headed to the same event as I was). The bus - KA-01-F-9090 of Davanagere depot. The bus was more or less full already. The bus works a Bangalore-Davanagere schedule, and is the first premium departure to Davanagere of the day. The bus seemed to have worked an overnight schedule the previous night - but was cleared of all the thrash before the trip began. The only tell-tale signs of the previous trip was the presence of a huge number of used blankets, all piled up at the last row. This was removed, and shifted to the boot just before departure. Our departure was delayed since another reserved passenger hadn't turned up. We finally pulled out at 0701hrs. The conductor kept calling out for more passengers till the time the bus entered the main road. The bus was more or less full already, though. 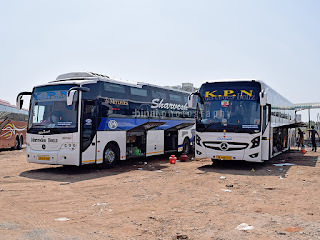 We picked up more reserved passengers at Navarang (0713) and Yeshwantpur (Govardhan Theatre, 0722). My colleagues were joining at Jalahalli Cross. I had dozed off in between, and woke up only as the bus was leaving Jalahalli cross signal. 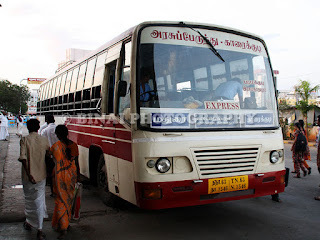 I was a bit confused where they were - the bus ran almost half a kilometre forward and stopped outside a KSRTC Travel house. They were no where to be seen - the conductor called them on their phone and informed them about where the bus was. It took them sometime to reach the bus, since they were waiting at the BMTC bus station, which is located before the traffic signal. We finally got moving at 0737hrs. I continued my sleep for some more time. I woke up just when the bus was pulling in for breakfast at Hotel Kamat, at Dabbaspet (0814hrs). Althought Kamat is a well equipped break point (not very "well" equipped), it is very pricey for the purpose. The prices burn down a big hole into one's pocket. We had our breakfast here. The crew were really quick with their food. We got moving again at 0837hrs. I continued my sleep for some more time. They did not play any music or movies (thumbs up for that). The driver maintained steady speeds in the range of 85~90kmph, and drove really well. The bus was full, and does not enter towns on the way. We finally pulled into Chitradurga KSRTC bus station at 1040hrs - almost 15 minutes before scheduled time. The bus had clocked over 10 lakh kms, and did really show its age. The bus looked battered and bruised outside - the interiors were in above average condition. The interiors were also tired and showed its age really well. The engine sounded quite strained as well. The crew were really good - they handled late passengers quite well (including yours truly) - no shouting at them, and talking very peacefully to each one of them. The driver was very stable as well. Overall, a good experience, and value for the money I paid. Will I take this service again? Its a great option. You really don't have too many options on the route.